Following a spell as Musical Director of an all-star tribute to Nigerian funk legend William Onyeabor, Ahmed Gallab is back to unveil his third studio album with Sinkane. Here Gallab discusses the influence of the recently-deceased Onyeabor, and explains how positivity and community became the driving forces behind Life & Livin’ It’s genre hopping pop. We began 2017 with the sad news that William Onyeabor had passed away. Considering what a deeply private man he was, you must feel very privileged that you got to meet him? Yeah, it was like a dream come true. I can’t explain it any other way than it felt like a movie; the entire time I was thinking to myself, “Am I really here? Is this actually happening?” All you heard about the elusiveness of his character was true. Even in his own house, talking to him, he was so private and very specific about what he wanted to talk about. But he was such a warm human being and you could tell, being in his presence, that he had a profound influence on so many people. It was an amazing experience. How has his music influenced you as an artist? Right around that time I heard "Better Change Your Mind" by William Onyeabor and it totally changed my life because I could really relate to the music. It was this distinctly African-sounding music that wore this American influence in a very earnest and inspired way, and yet it was transcendent of African music and also of American music. It was so unique and I could understand who William Onyeabor was just by listening to it, you know? I related to it and I told myself that that was what I wanted to do, just really exploring myself through my music. 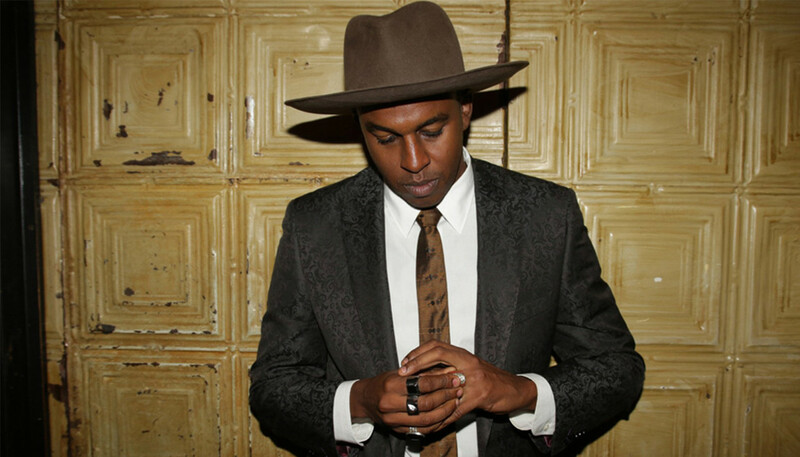 Had I not heard that I don’t think I would have moved forward with Sinkane the way that I did. Even though times are tough you can still be positive. In the time since Mean Love, you were Musical Director of the Atomic Bomb! Band, touring William Onyeabor’s music. What did you take away from that experience? Community. More than anything, community and camaraderie. It was a huge undertaking. There were so many people to wrangle onstage. We played at the Southbank Centre with a 100-person choir so it was 116 people on stage. But it shows you that music really brings people together, and there’s a collective consciousness that exists at the show. When there are so many people doing something and believing in something all at once, it creates this very special sense of community between the band and the fans. When we were rehearsing and more people were being involved with the shows, I realised how connected all of us as musicians were. It was really exciting and inspiring. For the benefit of people who haven’t heard Life & Livin’ It yet, where does it take your sound? What I did with this one was I went back to the last two albums – Mars and Mean Love – and I thought about the things that I did well and that allowed me to easily emote and articulate the message I was trying to portray, and I wanted to do those things better. Also, I realised that the difference between my concerts and my records was that my records lacked the energy that exists within my shows, because at my shows there’s four of us or six of us or eight of us playing, versus a record which is just me. So I decided that, with this album, we would do it live with my band; record all the music live and learn a lot of the music before we went into the studio. And that really brought that energy from the live performance, and that collective consciousness and community aspect of the music, into the album. So I think [Life & Livin’ It] is much more inspired, a bit more confident and it takes my favourite ideas of the last two albums and amplifies them a bit. You worked closely with Greg Lofaro during the writing process again. Are we right in thinking he takes care of lyrics? Yep, Greg is my guy. He’s my right hand man; he’s been there for me from the beginning. In the past it was him and I doing a lot of the arrangements: I would play all the instruments, I would come at him with a solid foundation of what we wanted to do and he played this editor role that really helped me understand how to approach my songs. With this album, I think I was a bit more confident and I came into the studio and told him I wanted to flesh out all the ideas on my own and then we’d talk about the ideas that I wanted to sing about, and what the record was about. He’s such a great lyricist. It’s very easy for him to eloquently express something, and [our relationship has] turned into this thing where I’ll write a song and I won’t even worry about the lyrics. I’ll tell him, “This is what I want to talk about,” and I know he’s going to come at me with something beautiful. I love that tradition of working with someone else on lyrics. It reminds me of Elton John and Bernie Taupin and also the Grateful Dead, who had a lyricist. What were the themes that you took to Greg this time? I really wanted to talk about my identity, I wanted to talk about religion, and I wanted to talk about politics, be that personal politics or world politics that were attached to my experiences. The entire record is all about specific and personal experiences that I’ve had. My ultimate aim with Sinkane is to connect with people. I want to be able to let people who, like me, have felt lost and not attached to any identity in particular, feel like they’re not alone. You know there are a lot of Sudanese expats or children from a second generation diaspora who grew up confused because they don’t feel at home where their family moved to, and they don’t feel at home where their family came from. It’s a pretty tough and confusing upbringing and I know for myself it’s really important that there are other people like me and I can connect with them. So I talked about those experiences, but there were also a lot of universal themes. Like, I stopped drinking a year and a half ago and I wrote "Won’t Follow" about it because it changed my life. Why did you quit drinking? I don’t think it was necessarily a problem for me but I just wanted to get really focused with my career and understand myself a bit more. I just felt like drinking turned into this thing where I was using it to stop thinking about anything, you know? When you go on tour and you spend so much time away from home, sleeping in a different bed every night and not having much of your own personal space, when you do get that one day off it’s really easy to unleash all of the pent-up energy you have inside you. I saw myself doing that kind of thing and I realised it was a really counterproductive way of living, you know? I wanted to get healthy. Life & Livin’ It is a really joyful listen. Was that the intention? Absolutely. Something that I’ve noticed in the past couple of years – living in the internet age and having that echo chamber around me – is that a lot of people around me were pessimistic, or the political climate was making people very cynical and jaded. There are some people that can get inspiration from being pessimistic or stoic but I thought it was really important for me to respond to that with a really positive attitude. About a year and a half ago, I started posting a positive message on my Facebook page every morning, like, “Good morning everybody, I hope you all have a great day and I love you.” I saw how that resonated with people and also it made me more positive and more excited, so I still do it to this day. I was able to take that energy with me and put it into this record. I think people take for granted how important positivity is in your life. It could be one Sinkane song that you listen to that could make your day, or some other song, like Bobby McFerrin’s "Don’t Worry Be Happy" or something. I want people to understand that even though times are tough you can still be positive. What have you learned in the process of making this album? I’ve learned how to trust other people. You know, I tend to be kind-of a control freak with my music. I told myself 10 years ago when all of my bands broke up that I would never do a collaborative project again. Because usually what happens if you go into a project collaborating with people, is that within the next five years your band breaks up. That’s what happens with 95% of those bands. So I wanted to really express myself and have no-one to respond critically to me, but the more that I started doing it, the more that I realised it takes a village. Nobody can really do it on their own, and if you do, you turn into an a**hole to some extent. With this album in particular – working with Jonny Lam our guitar player, Greg [Lofaro], and Jason Trammell – I learned that if I take my hands off the brakes and let people work with you, they’ll come and make the music even better. Just because you’re relieving yourself of that kind of control it doesn’t mean that ultimately you’re letting go of everything. And the music is much better because everyone feels connected so it resonates with people a lot more. That was a big thing for me.